Artist Buzz Spector uses the theme of an “open book” for Crenshaw Stories. As is the case throughout Los Angeles, people living in the neighborhoods surrounding the station speak a number of different languages. Spector collected stories from these residents in several languages including Spanish, Korean, Japanese, Chinese, Thai, Arabic, Russian and Tagalog. 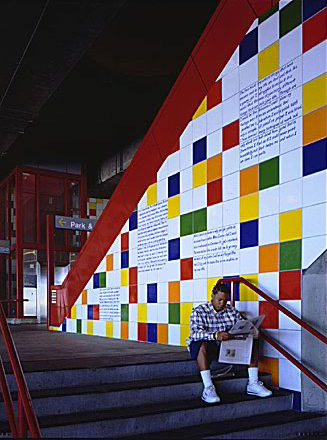 Seventy-two of these stories were hand-painted onto tile and interspersed with color tiles at the entrance to the station. In addition, seventy-two of the most commonly spoken languages by children in Los Angeles public schools, each coupled with the word "American," are embedded at intervals across the platform. The book motif has also been incorporated into the design of station seating and paving patterns. 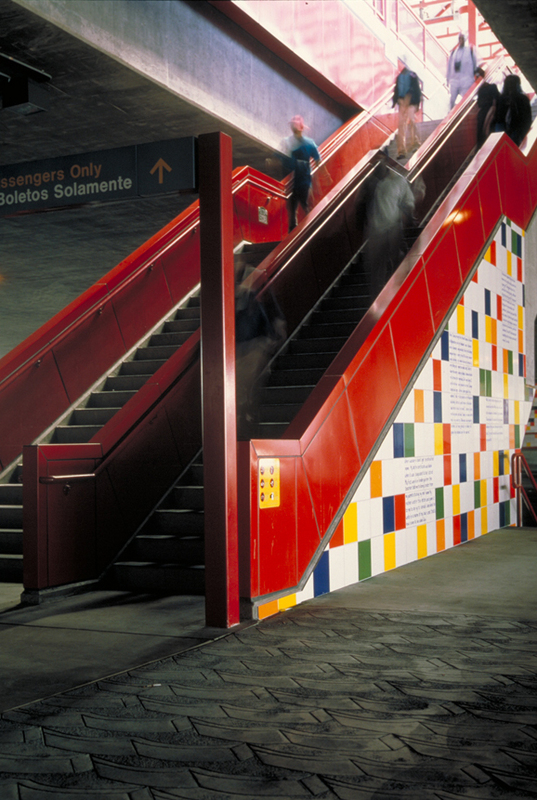 Spector’s work provides a unique and colorful identity to Crenshaw Station while providing connections between people, between places, and between times. BUZZ SPECTOR spent two childhood summers living within miles of the station site but primarily grew up in Chicago. Until recently, he lived in the Mt. Washington area and had a studio in South Central Los Angeles; he now lives in Ithaca, New York where he teaches at Cornell University. Spector’s work uses the book as subject and object of inquiry into the relationship between history and memory, and uses the library as a metaphor for both. This is Spector’s first completed public commission.